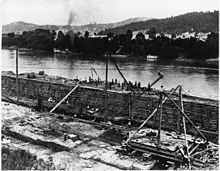 The history of United States Army Corps of Engineers can be traced back to 16 June 1775, when the Continental Congress organized an army with a chief engineer and two assistants. Colonel Richard Gridley became General George Washington's first chief engineer. One of his first tasks was to build fortifications near Boston at Bunker Hill. 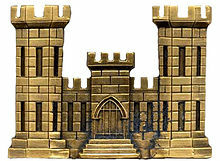 The Continental Congress recognized the need for engineers trained in military fortifications and asked the government of King Louis XVI of France for assistance. Many of the early engineers in the Continental Army were former French officers. Louis Lebègue Duportail, a lieutenant colonel in the French Royal Corps of Engineers, was secretly sent to America in March 1777 to serve in Washington's Continental Army. In July 1777 he was appointed colonel and commander of all engineers in the Continental Army, and in November 17, 1777, he was promoted to brigadier general. 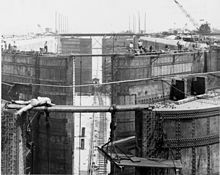 When the Continental Congress created a separate Corps of Engineers in May 1779 Duportail was designated as its commander. In late 1781 he directed the construction of the allied U.S.-French siege works at the Battle of Yorktown. On February 26, 1783, the Corps was disbanded. It was re-established during the Presidency of George Washington. From 1794 to 1802 the engineers were combined with the artillery as the Corps of Artillerists and Engineers. 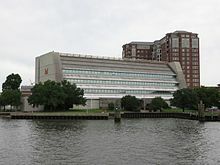 ^ a b "About -- Headquarters U.S. Army Corps of Engineers". usace.army.mil. Retrieved 12 January 2015. 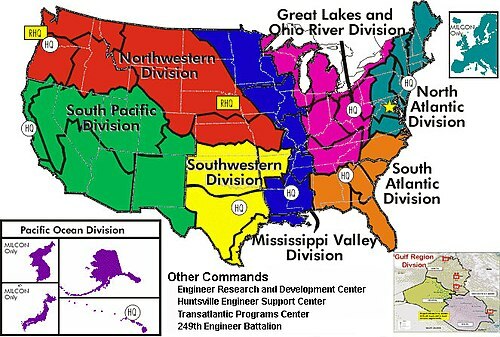 ^ "Historical Vignette 009 — How the U.S. Army Corps of Engineers Became a Major Army Command". U.S. Army Corps of Engineers. Retrieved 11 June 2011. ^ "Biography of Debra M. Lewis". Retrieved 8 October 2014. ^ "Lake Survey". Greatlakesmaps.org. Retrieved 9 October 2012. ^ "Headquarters". U.S. Army Corps of Engineers. Retrieved 22 October 2012. ^ "Map -- Headquarters U.S. Army Corps of Engineers". 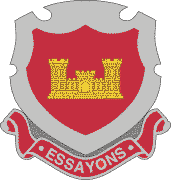 U.S. Army Corps of Engineers. Retrieved 27 April 2018. ^ "Honolulu District Corps of Engineers". Poh.usace.army.mil. Retrieved 9 October 2012. ^ "''Engineer Magazine'' article "Disaster Relief"" (PDF). Retrieved 9 October 2012. 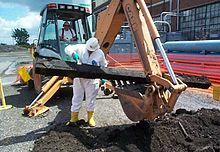 ^ "USACE Institute for Water Resources: Programs Overview". Iwr.usace.army.mil. Retrieved 9 October 2012. ^ Carter, Nicole T. (1 June 2018). Army Corps of Engineers: Water Resource Authorization and Project Delivery Processes (PDF). Washington, DC: Congressional Research Service. Retrieved 5 June 2018. ^ Frittelli, John (1 June 2018). 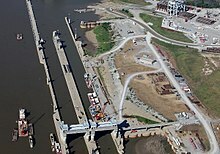 Prioritizing Waterway Lock Projects: Barge Traffic Changes (PDF). Washington, DC: Congressional Research Service. Retrieved 8 June 2018. ^ "Infrastructure Report Card". Infrastructure Report Card. Retrieved 9 October 2012. ^ "Branch eBook - Military Science and Leadership". Sites.google.com. Retrieved 9 October 2012. ^ Grunwald, Michael (2 August 2007). "''Time'' Magazine article". Time.com. Retrieved 9 October 2012. 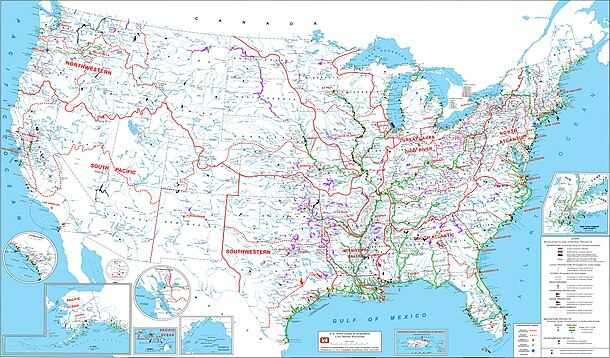 ^ "Close the Mississippi River Gulf Outlef — The Hurricane Highway". Mrgomustgo.org. Retrieved 9 October 2012. ^ Colley Charpentier. "Critics of Corps investigation". Blog.nola.com. Retrieved 9 October 2012. ^ "IPET Leadership" (PDF). Retrieved 16 January 2017. 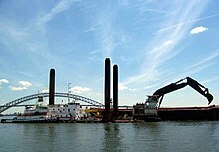 ^ "U.S. Army Corps of Engineers Home website". Usace.army.mil. 25 September 2012. Retrieved 9 October 2012. ^ Terry Baquet, The Times-Picayune. "Water bill passes despite Bush veto". Blog.nola.com. Retrieved 9 October 2012. Stars and Stripes (1945). Engineering the Victory: The Story of the Corps of Engineers. Retrieved 11 November 2014.